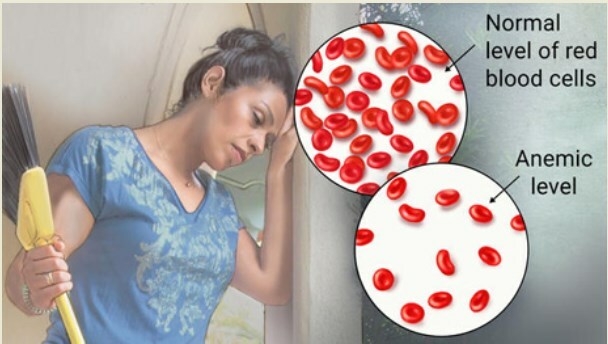 Some patients with anemia who has no symptoms, It is worth noting that if anemia is longstanding (chronic anemia), the body may adjust to low oxygen levels and the individual may not feel different unless the anemia becomes severe. On the other hand, if the anemia occurs rapidly (acute anemia), the patient may experience significant symptoms relatively quickly, and even with relative mild fluctuations of hemoglobin levels, who has the anemia symptoms these are as follow as below..
Types of Anemia : Seven types of Anemia are given below.. Causes of Anemia : Any process that can disrupt the normal life span of a red blood cell may cause anemia. Normal life span of a red blood cell is typically around 120 days. Red blood cells are made in the bone marrow. Anemia is caused essentially through two basic pathways. Anemia can be caused by these reasons which is given below..
A more common classification of anemia (low hemoglobin) is based on the Mean Corposcular Volume (MCV) which signifies the average volume of individual red blood cells. Prevention of Anemia : To prevent anemia you can read given instructions which is given below.. In order to prevent Anemia Eat, healthy and balance diet with rich in iron . Reduce tea and coffee because they make it harder for your body to absorb iron. Increase Vitamin C in your diet it may help iron absorption to your body.